Today is Palm Sunday, the start of Holy week and it's exactly one week before Easter Sunday. Each Palm Sunday, Catholic Churches hand out blessed palm branches to the congregation. Tonight we will be attending our first Palm Sunday Latin Mass at a local church which I hear is especially beautiful! I just found this video this year via Facebook and it is a powerful one for Palm Sunday so I wanted to share it! To see Jennifer's full post and tips, including how to make a crown with your palms go HERE. So Holy Week begins today and the 3 holiest days of the Catholic Church's calendar are coming up on this Holy Thursday, Good Friday, and Holy Saturday. 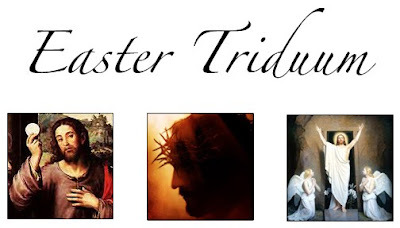 These 3 holy days are called the Easter Triduum. This is a special time in our family's life, not only because we remember Jesus' passion, death and resurrection, but also because it was 7 years ago at the Easter Vigil Mass on Holy Saturday that my husband and his cousin entered into full communion with the Catholic Church. Here we are just before this special Mass began. Sharon and Patrick, together forever on earth and now in Heaven. We love and miss you so very much! May you and your family and friends have a blessed Palm Sunday and beginning of Holy Week 2013! Be sure to visit my blog again soon as I will be posting about our Holy Week traditions that we love do to each year as a family! Absolutely beautiful, touching and incredibly informative post, Tracy.... Thank you! Have a blessed day and thanks so much. This is a beautiful heart-felt post! And I'm very sorry for your loss. It's nice that your cousin was able to join the Church before she went to meet Jesus. Take care, I hope your pregnancy is going well! Yes, this is a beautiful post!! And thank you for another great video. I just shared the one with the two young men with my boys- they could relate!! Blessings to you this week!